Five is the magic number for Lewis Hamilton as he looks to wrap up the Formula One title at the Mexican Grand Prix for the second successive year. The Mercedes driver is on the cusp of his fifth world title and needs only five points over the final three races to clinch the drivers' championship. Achieving that goal would put him level with the great Juan Manuel Fangio for number of championships, with only Michael Schumacher ahead of him on seven. However, Hamilton will know nothing is guaranteed after he missed out on securing the title in the United States last weekend. Hamilton led with 19 laps to go at the Circuit of the Americas only to have to pit as his soft tyres failed him, allowing Ferrari's Kimi Raikkonen to leapfrog him and prevail. The Briton was frustrated by that turn of events but is confident Mercedes will bounce back at the Autodromo Hermanos Rodriguez, the scene of his title-winning celebrations in 2017. He said in his debrief on the Mercedes website: "No one is to blame, we all take the blame together. We will kick ourselves in the backside and keep working, keep pushing. "I know that the guys will do a great analysis from the weekend over the next couple of days and we will come back stronger the next race." 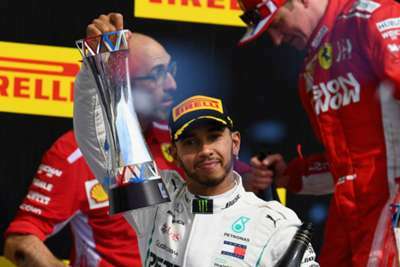 Ninth place proved enough for Hamilton to take the crown in Mexico last year following a clash with Sebastian Vettel, going two places better this time around will see him defy his Ferrari rival again and join a very exclusive club. Fernando Alonso is approaching the end of his F1 career, barring a surprise future return for the two-time world champion, but he could still achieve a first in the sport before his time is up. Alonso, with help from his helmet supplier Bell, could trial a new drivers-eye-view on-board camera in one of the final three race weekends. "Maybe for the last race or something it would be a nice memory to have," Alonso said of the possibility in quotes reported by Autosport. Despite his disappointment in Austin, Hamilton was in high spirits on Monday as he met up with friend and New York Giants star Odell Beckham Jr.
Hamilton and team-mate Valtteri Bottas took in the Giants' clash with the Falcons in Atlanta, but his presence was not a good luck charm for Beckham as New York suffered a 23-20 defeat. The F1 title has been decided in Mexico four times with the victor on three of those occasions being British, John Surtees in 1964, Graham Hill in 1968 and Hamilton in 2017.